Successfully Added Displaymax D2200 - HD Multimedia Projector with HDMI, VGA, AV, More to your Shopping Cart. New HD Multimedia Projector with HDMI, VGA and other AV inputs for a full array of business, classroom and home entertainment viewing. This high definition Multimedia LCD Projector is perfect for either productivity (teaching, meetings, etc.) or entertainment uses. With multiple types of video input options, feel free to use your wall or a projection screen to display an image size up to 150 inches from your computer or AV devices. Often used in classrooms, conference rooms, hotel meeting rooms, sports restaurants, or home theaters, HD Multimedia Projectors are well suited for any presentations or entertainment gatherings where an extra large screen size is desired. The Displaymax D2200 HD Multimedia Projector is a great way to get a big screen size without using up a lot of your room's space. Providing you with HD support up to 1080P and a 800x600 native resolution, this China Wholesale Projector is ideal for providing clear, crisp images for any type of media from videos and TV to powerpoint and excel files. The Displaymax D2200 HD Multimedia Projector can be used in any number of settings such as offices, conference rooms, classrooms, living rooms, etc. Using the convenient 9-in-1 AV input panel, you can input HDMI, VGA, SCART, Composite and Component AV devices, meaning you can pretty much feed any computer or multimedia device into the Displaymax D2200 HD Multimedia Projector and start viewing them is big screen comfort. The Displaymax D2200 HD Multimedia Projector uses a 2200 lumen color enhanced LED projection lamp, giving you a vivid color display that will never need any maintenance! Whether you decide to use it on a table, mounted on a wall or even ceiling mounting, once it is setup the way you like it you can just use the full function remote to control all the Displaymax D2200's features, meaning after you set it up you will never need to touch it again. On top of the super combination of impressive feature set and ease of use, the Displaymax D2200 HD Multimedia Projector also comes with an unbeatable low China Wholesale Price. 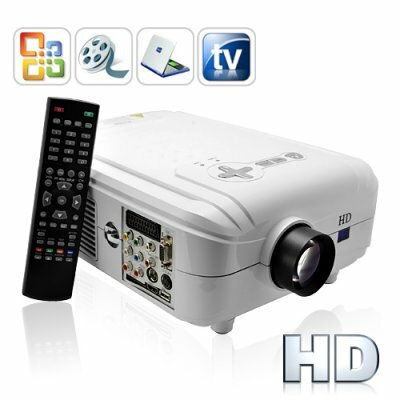 This Multimedia HD Projector is perfect either for the resale market, OEM market, or personal/company use. Brought to you from your source for factory-direct China electronic products, Chinavasion. Built in Analog and DVB-T Digital TV Tuners! What are the advantages of the Displaymax D2200 HD Multimedia Projector versus other LCD Projectors I have seen? Who needs a Multimedia LCD Projector? Anyone who is looking for a large screen display but does not have the dedicated floor space or budget for a large Plasma or LCD Monitor. For example, a 65 inch Panasonic Plasma TV costs $2500 and you are getting less than half the screen size you could get from the Displaymax D2200!